We leave our house to go home! We are told we are going home. You can’t see it now; it only fills up with water when it rains. My father hands me an un-embellished, “No”. My mother gives me a flat “No”. On this, they speak as one. We pack our bags, clothes, toy cars, toy snakes, lizards made of rubber, obviously fake. We haven’t yet discovered we need 8 glasses of water a day to stay healthy. To eat, we must wait seven hours to get home. Only wholesome home cooking will do. No food for the road. Sugar, tea leaves, oil, butter, maize meal in packets. Hot drinking chocolate, sausages, bacon; we can still afford these things. And 8 long loaves of Kumyoko bread. We get into my Dad’s car, a brand new VW Beetle. Five young children, a mum, a dad and a cousin- maid. There’s that un- embellished “No” again! We have never gone this far, in our fun- filled- after- Church- Sunday- drives. It can’t be much further! We leave our house to go home. 30 more Kilometers, hope returns. It bounds back, panting, joyful like a puppy. Mum’s says, “Stop disturbing your father, let him drive”. There is no joke anymore. I exhale all my hope. How far do we have to go to get home? We start a steep climb on a narrow road. Sheer cliffs rise on one side and fall down on the other. The road winds like a snake trying to escape. Down, down, down to a verdant equatorial green land that belongs somewhere else. Not here, in this dry country Kenya. All of it was lost on me. My mind echoes the city lights. Is there light at home? My father laughs again, this time amused. His eyes touch mines in the rear view mirror. Electricity does not stretch so far. He says. He is, matter-of-fact, “there is no light at home”. No disco dancing neon light? No hanging out at Carnivore on a hot night out? No chilling with a hoard of hungry boys at night? No light to bathe me, wash me clean. There is no light at home? Punctures start coming thick as rain! The first is a joyous affair. We all believe it won’t happen again. By the third puncture we all know to change a tyre, even my kid brother. Step four, fix the puncture. Maybe home is sending a message in its own crude way. It does not want us to return. Home speaks secret words buried in/ gleaned from/ repetition. It sends a celestial whisper. There is nothing left for you here! The car starts to bump, list, sigh, it slows down it protest. It is not used to such rough treatment. I hit my head on the roof on the car, more than once. There are no roads here no. Just tracks made by cattle, barely visible in the bush. We reach a bridge of old wooden planks and colonial memories. It looks too frail to hold a car weighed down by mum, a dad, five kids and my cousin maid. My kid sister starts to wail. “No, no… I don’t want to go home! We are in a land of real rivers; raging torrents of water flows fast and furious. with the name “River Something” on a sign post; like many others we pass on our way home. No. This is the River Nzoia. It’s a real thing and just as dangerous. She holds her hands outstretched her body rigid in a ricktus of astonishment. lifted in celebration and wailing welcome. She and I come from different countries, she doesn’t speak English, we don’t share a president,. No wonder she looks foreign. Riswa! She ends the prayer with a loud abrupt song. On cue, hard feet clap the ground a whole village together, PAP! I fall to the ground, cower, covering, my head to hide from the danger. Joking hands raise me up. I stand shaky as the laughter around me continues. I learnt a lot from that prayer. We are Jews from Israel! Those almost white legs on a black woman? Wouldn’t you want some of that almost, almost? I won’t get any male attention. She knows how to play. She laughs at jamaa’s stale jokes. Sitawa Namwalie is a poet, writer and performer interested in how Africans are defining themselves in today’s world. In writing she finds her expression. In 2008 her first dramatised poetry show by the name Cut Off My Tongue was successfully performed in different venues in Nairobi. In 2009, her first book of poetry, Cut Off My Tongue was published. Later the same year, the show was performed at the prestigious Hay Festival in the UK. And in 2012 it was performed in Uganda. She was nominated for the Freedom to Create Prize in 2010 for the courage and positive social influence of her poetry. 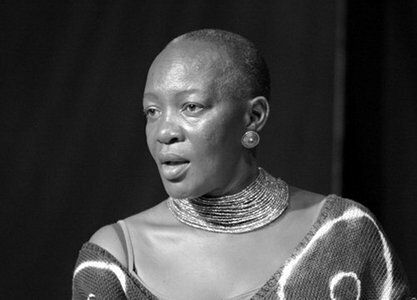 In 2011, her second show of dramatised poetry called Homecoming was performed in Nairobi to rave reviews. In April 2012 Cut off my Tongue was selected by TED Talks on a global search for the new and undiscovered as a performance worth spreading. Sitawa has worked in the development sector for many years with NGOs and with UNDP, USAID and IUCN. She holds a Bachelor of Science degree in Botany and Zoology from the University of Nairobi and a Master of Arts degree in Environment, Society and Technology from Clark University in Massachusetts, USA. She works as a development consultant in the areas of environment, gender and governance. Sitawa has achieved excellence in many areas of life, including representing Kenya in tennis and hockey in her youth. She is a mother of three gorgeous children and is married to a man of rare generosity.